Wondering about the various chinchilla colors? Here are some of the variations. Click here for standard (gray) chinchillas. Detailed descriptions are below. Please submit your cute chinchilla photos! Contact us and we'll tell you how. BEIGE - A dominant gene. A chinchilla referred to as just Beige is a Hetero Beige and is genetically Beige + Standard. A Homo Beige is genetically Beige + Beige. It may be more accurate to call this an incomplete dominant gene as homozygous recessive colors can show through the beige color. CHARCOAL - A recessive gene. A chinchilla referred to as Charcoal is genetically Charcoal + Charcoal. This chinchilla looks like a medium light Hetero Ebony. It can be hard to differentiate them if the animals pedigree is uncertain. Probably unavailable in the United States. EBONY - A weakly dominant accumulative gene. A chinchilla referred to as just Ebony is genetically Ebony + Ebony while a Hetero Ebony is Ebony + Standard. It darkens any color that it is combined with and creates the "wrap around" effect - tummy color same as the back color rather then whitish. 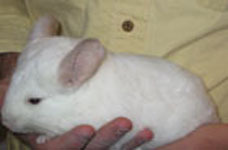 Hence, a Tan chinchilla (Beige + Ebony) is dark beige with a beige tummy. 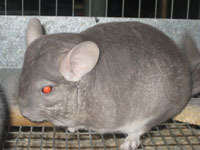 A Solid Violet chinchilla (Violet + Ebony) is dark violet with a violet tummy, etc. The "accumulative" nature of the gene refers to the fact that successive generations of breeding into Ebony creates darker and darker animals. SAPPHIRE - A recessive gene. A chinchilla referred to as Sapphire is genetically Sapphire + Sapphire. 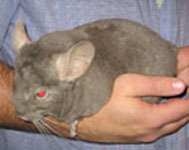 This chinchilla looks like a very light Standard, with a distinctly bluish cast and pink ears. STANDARD - The original wild color, often referred to as Standard Gray or just Standard, this gene is recessive to Beige, Velvet (TOV, Black), and White. It is weakly dominant with Ebony. It is dominant to Charcoal, Recessive Beige, Sapphire, and Violet. A chinchilla referred to as simply Standard is genetically Standard + Standard. This gene is present in basic White (White + Standard), basic Beige (Beige + Standard), and Black Velvet (TOV + Standard). It is also present in the Hetero Ebony (Ebony + Standard). In the heterozygous state with Charcoal, Recessive Beige, Sapphire, or Violet you would get a Standard/ Charcoal carrier, Standard/ Rec. Beige carrier, Standard/ Sapphire carrier, or Standard/ Violet carrier. VELVET - A dominant gene, also referred to as TOV (Touch of Velvet) or "Black". This gene, like Ebony, is a gene for color PATTERN rather then color. It darkens and solidifies any color that it is combined with, creates a distinct contrast between the back and tummy color, and causes distinct stripes on the front paws. Hence, a Black Velvet is TOV + Standard, a Brown Velvet is TOV + Beige, or you could get TOV White, TOV Violet, TOV Sapphire, and many more. This gene cannot exist in the homozygous state due to the lethal factor. VIOLET - A recessive gene. A chinchilla referred to as simply Violet is genetically Violet + Violet. WHITE - An incomplete dominant gene. White Mosaic , Wilson White , and Silver chinchillas are all genetically the same - White + Standard. They vary phenotypically due the degree of influence of the Standard gene and the incomplete dominance of the white gene. This gene cannot exist in the homozygous state due to the lethal factor. More on the genetics of chinchilla colors.